In the burger world, there seems to be a distinction between the high-end, fancy burgers, and the quick bite you grab when you’re starving (or on your way home from the bar). I decided to see for myself whether this distinction really exists by trying out a restaurant known for its burgers and comparing it with a little in ‘n out type of burger joint. The Better Burger. Note how the Zingerman’s bun defies compression. My first stop was Grizzly Peak Brewing Co. The place was renowned for its variety of beer brewed on site and its excellent “step above bar food” dishes. I’d heard that this was the place to go for a burger, so my expectations were high. I ordered the 7 beer sampler and a burger with cheddar cheese and caramelized onions with sweet potato fries on the side. The beer was excellent, with lots of variety and flavor, and most importantly, the sampler glasses were generously full. My burger on the other hand, was thin and greasy. The meat had no seasoning and the bun did that gross crumpling thing that McDonald’s buns do. The sweet potato fries were also kind of disappointing… mushy and greasy, but still, they were sweet potato fries. 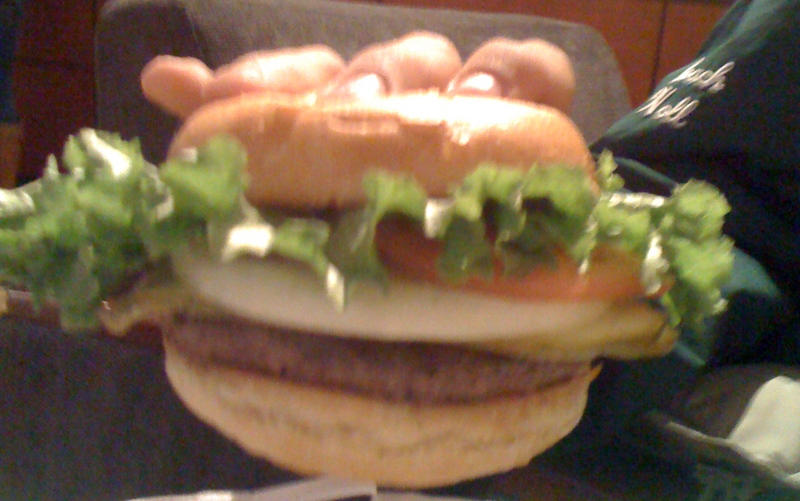 Overall, the burger wasn’t gross…it was still, after all, burgery meaty goodness, but I don’t see what the hype is about. My boyfriend’s reuben sandwich looked (and tasted) a lot better. I followed up with a visit to Great Plains Burger Company, a smallish place right next to Qdoba on Plymouth. It looked fairly new and the menu was short and straight to the point: burger, toppings, fries, shake. (Just like In-N-Out!) Ordering was also fun, especially because ALL the toppings are free! And are there ever toppings! Blue cheese, sautéed mushrooms, grilled onions, jalapenos…must I go on? And most importantly, a Zingerman’s bun! I tried out a “single” with blue cheese, tomato and lettuce. The meat was better this time… not as greasy, but still not quite “juicy”. The bun and the additional ingredients however, made all the difference. Maybe it’s that they use local ingredients…or maybe they’re just fresher, but for $4.50, this burger definitely beat anything else in terms of value AND taste. The fries too, were okay, although the restaurant made a big show of how they hand cut them, with piles of potatoes everywhere. Perhaps if they “handcut” them a little thinner so they cooked through? But overall, I left much more satisfied. Still, I realized that both places hadn’t done much different with the meat. Maybe a ground meat patty is just…ground meat. Maybe there’s only so much to be done with it. Unless you count those weird $50 burgers where they stuff them with cheese or capers or other “fillings”…personally I don’t think that counts. Obviously you can season the meat and make them thick and juicy, but at the end of the day, ground meat probably not the part of the cow most people want to eat. But interestingly enough, I’ve been told that ground sirloin also tastes like…ground meat. (and is a waste of perfectly good sirloin). If that’s the case, there’s really no point in paying for a $10+ burger at a restaurant. So next time you want a burger and some good beer…go to Grizzly Peak, have lots of beer, and then once you’re smashed, pick up a burger from Great Plains on your way home.